In Sierra Leone today, water is perennially scarce. Its insatiable demand has outstripped a stagnated, disrupted supply. In the dusty, thirsty capital city of Freetown, with scourging heat and temperatures reaching extremes, this threatens the people with dehydration and serious health challenges. Still struggling to get back on its feet after a decade-long civil war that ended in 2002, this nation of 6 million has seen a surge in migration in recent years, which has put a strain on already scarce resources, including food, housing, employment, and perhaps most importantly, water. A complete overhaul of the country's structural water supply system needs top priority, but the nation's infrastructure has become obsolete, worn out, if not nearing breaking point. Government still crawls to measure up with technology that operates at fiber-optic pace in a modern economy. The necessity for capital investment is paramount and urgent. If electricity were stabilized, water pumps could be installed in vulnerable locations, so that pressurized water could reach consumers living at high gradient or mountainous regions. But service providers are seemingly apathetic to the needs of the consumers, neglecting maintenance until service finally breaks down. For most of the year, Freetown residents face serious water shortage. Essential service hubs, such as Connaught Hospital, Princess Christian Hospital and local food markets in the heart of Freetown, see their taps run dry. Folk roam around with large plastic containers roaming for water like on a marooned Island. Those employed go to work with containers to fetch water. People who can afford it install water tanks, and for a price they can get a supply from fire trucks of the nation's Fire Force Brigade. Yet even for those who can afford this, it is not uncommon for duels to spark between employees of Guma Water Company and Fire Force workers, in some cases resulting in death. The unavailability of water also renders citizens susceptible to outbreaks of communicable diseases. Without the ability to frequently wash their hands and kill bacteria, the spread of cholera or swine flu threatens the nation with epidemic. Yet no one looks out for the most vulnerable segments of the population, and while women and children get sick, the scarce amount of this essential resource ultimately is routed to the highest bidder. To help ease the burden of the suffering masses, various communities began digging water wells with support from some elected leaders. From Wilberforce on the west to Kissy Road in the east, wells popped up all around Freetown, mostly in densely populated areas. But the government has capped the number of wells being dug in the poor community, leaving many communities without access or with wells that have broken or dried up. Meanwhile, about 400 meters from the town of Grafton is a water plant factory, Grafton Spring Water, that sells the finest and most refreshing bottled water in the nation. On April 18, 17-year-old Aminata Kamara, a student of Wallace Johnson Memorial School, went to the only well in the area to fetch water for domestic use. While she was collecting it, a boulder tumbled down and crushed her, killing her. Two other students were also injured but were rescued from the gruesome accident. The tragedy precipitated a convulsion of grief in the community, and many blamed the elected leaders for not being sensitive to their pressing needs. Although Member of Parliament Julius Cuffie came to the scene to express condolences to the families affected, he received angry jeers, with people yelling, "Cuffie, go away, go away!" While the government will be needed in finding a solution to these problems, tensions between the public and their officials remain ripe. Amid the heartache and growing challenges there is a glimmer of optimism. 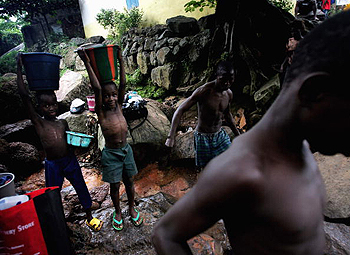 In some areas, the people of Sierra Leone are taking the water crisis into their own hands. The Mojabi Cave Well, which was built about 50 years ago at New England Ville, was once considered a death trap. Youths in the area mobilized and formed formed the Water of Life organization, which explores solutions to urgent local needs, focusing on the ageless water problem. They collected donations from residents and well-wishers to fund the refurbishing of the well. Because of their efforts, the well now services some 6000 people. Assessing the bigger picture, water experts have advised that the Orogu River at Hastings Village is the answer to the water supply crisis in Freetown. Atkins consulting firm of the U.K., assisted by other local partners, including Oxfam and a local engineering firm 3BMD, studied the water and sanitation problems in Freetown to help craft a long-term solution. Leading consultant of Atkins, Richard Shepard, stressed that with the current population explosion prevalent in the city, compounded with the stride for development, the Orugu Dam is the only lasting solution to the water crisis in the city. The current Guma supply to the city is 83 million liters a day, equivalent to 16 million gallons a day. The Orugu project in the initial stage would provide the city with an additional 75 million liters (12 million gallons) of water per day. The studies said that the Orugu scheme came in three stages. As the first phase could provide the city with a total of 28 million gallons per day, the second and third stages could triple that number. Douglas Hunt, another Atkins consultant, appealed to the government to halt all developmental activities within the catchments perimeter. On the sanitation problem, Jonathan Parkinson and others solicited government to reintroduce rigid laws on health and sanitation. An official of Guma pinpointed that the current Guma facility could no longer cope with the alarming population explosion in Freetown. The minister of Lands, Country Planning and the Environment, Dr. Dennis Sandy, while addressing a session of Parliament, recently said, "I'm willing and ready to expose with evidence to substantiate my point that some parliamentarians in the Western Area are indeed involved in illegal land transactions." While a foreign critic interjected that corruption is not a native of any land, it finds easier homes in some. Nobel Peace Prize Laureate and first African woman to win the prestigious accolade, Kenyan born Wangai Maathai, in a fierce and urgent speech in London, said recently that there is a change taking place. "Nature is still being taken for granted. Yet when it is destroyed, life itself goes. Politicians [everywhere] are putting immediate needs ahead of the long term. We must challenge the decision makers. We must appeal not just to their heads, but to their hearts. I can only see things getting worse if we do nothing," she emphasized. Sierra Leone and the rest of the world need to heed Maathai's passionate appeal.